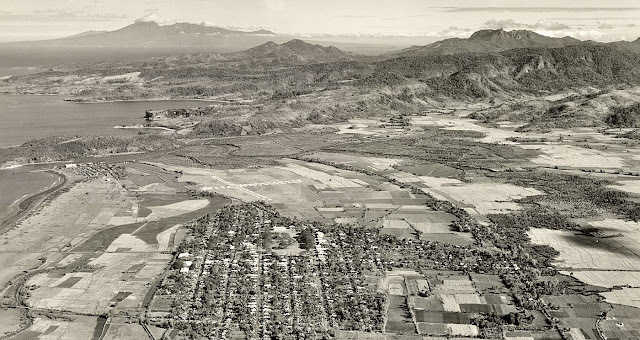 The town of Nasugbu during the American era, with the airfield visible from the air. Image source: United States National Archives. The airfield had two runways that intersected at one point. The primary runway had a length of 634 yards and ran from north to west. The secondary runway, on the other hand, was 448 yards long and ran from north to east. Both runways were 8 yards wide. The runway surfaces were “sandy and whitened with ash.” The white was clearly visible from the air, along with the circle at the runways’ point of intersection. This was intended to aid pilots find the runway. There were no provision, however, for night landing and takeoff. The rest of the airfield’s surface was “grass with dirt.” Its wind indicator, as weather vanes in airfields were called, was south of the main runway, north by west. The airfield was surrounded by shallow water to its west; some low nipa houses and telegraph poles to the south; and by sugarcane fields elsewhere. Aircraft approaching or leaving the landing field faced no obstructions from all directions although pilots needed to be careful of power lines to the south, estimated to be 19 feet high; and nipa houses placed at 18 feet high (probably including the elevation of the land). Below is a location sketch of Nasugbu and with the Nasugbu Airfield or Landing Field shown. A sketch of Nasugbu with the airfield shown. Image source: United States National Archives. An aerial shot of Nasugbu is show below, again with the airfield visible. The Nasugbu airfield seen from above. Image source: United States National Archives. 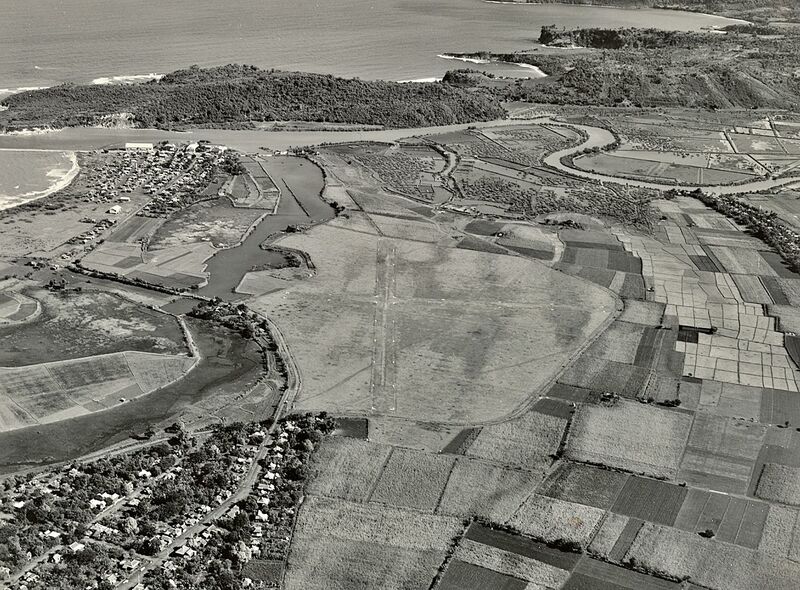 Finally, another aerial shot of the Nasugbu Airfield with the sea in the background. 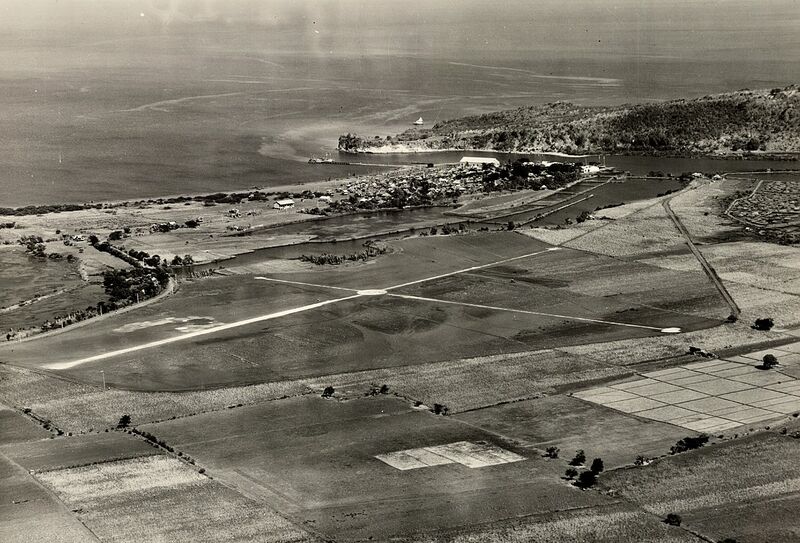 A shot of the Nasugbu Airfield with the sea in the background. Image source: United States National Archives. 1 Along with some other details of this article, from “Aerodrome and/or Landing Ground Details,” online at the United States National Archives. 2 Roxas y Cia was a family owned trading company founded by Don Domingo Roxas in 1840. It would later be renamed to Ayala y Cia. “Family dynasties rule business,” by Efren S. Cruz, published 2014, online at Philippine Star Global.